I don’t think I’ve ever done a purely “have a look at these” post. But here are some starting points for inspirational Weekend-Web-Wandering over the holiday. Links to links ! Enough for two weeks of this – first on fashion and sewing. Later on personal style. Here’s a list which claims to be the top 99 most influential fashion blogs. It’s a good season for remembering the difference between style and fashion. Have been looking at a UK magazine issue for this month. Which says this summer we must wear black and white, or bright colours in big florals or blocking. Emerald, sunflower, red, bright blue, fuchsia. Well, those will only flatter people with ‘Winter’ or ‘Spring’ type colouring. And within those colour groupings, only people with some colour personalities and some personal styles would be happy wearing them. Also apparently neutrals (grey, navy, dark brown) are a no-no this season. Actually that leaves out a big colour story this summer, the pale beiges and pastels (see Cos) – good for some ‘Summers’. ‘Autumns’ ? – how about some gold or bronze metallic, or tangerine, greyed jade, chartreuse. Here’s the Pantone spring 2013 colour report. And there’s the grey/ silver metallics and sheers. Happily other sources have a wider range of ideas about this season’s possibilities. Here’s the Style.com US Vogue spring 2013 trends. YouLookFab lists must-haves for spring/summer 2013. And have a look at what M&S thinks we should be wearing this summer. Set the occasion on the left, the current ‘look’ at the top, and see what they suggest ! Fashion of course, no allowance for personal style. Plus lots of videos of models wearing the outfits. I don’t find them at all tempting (they might not mind this – I doubt I’m their target customer :D), but they are entertaining. Yet more delight from looking at clothes ? explore the outfits at Polyvore. While Style.com have already listed all the RTW fashion shows for winter 2013. Sewaholic patterns come out top pattern company in the Pattern Review of top patterns in 2012. Good instructions, and some patterns have on-line sewalongs (sorry, they’re for pear shape people). There are many easy free download patterns from Hot Patterns, if you’re looking for an ‘instant gratification’ project quick enough to make over the weekend. Dozens more quick free sewing patterns at AllFreeSewing. Though no guarantee of the quality of the patterns or instructions. Or look through the Hot Patterns videos – they are intended (and effective :D) to get you to buy their main pattern line, but there’s a lot of useful information as well. They actually have a ‘channel’ on YouTube. Click on the words “Uploaded Videos” in the button. Or explore FashionSewingBlogTV if you like to watch easy videos about technique. Or do it without pressure and follow the seasonal capsule sew along – always one in progress. Back to serious – you can sign on free for a couple of days at The Sewing Guru (it’s easy to cancel the instructions at PayPal). You might manage in one weekend to watch all his videos on making a tailored jacket, but would you remember it all 😀 If you get hooked you may want to stay a member so you can watch them slowly. At the advanced end of the technical skills scale, couture companies like Chanel give more details about what underpins their collections. Hermes have videos about the work of their expert artisans. Second post planned on links for exploring personal style. Following up all this could take weeks not days ! A new wardrobe pattern book, ‘Dressmaking’ by Alison Smith, includes good photo instructions for making about 30 garments, based on classic patterns for tops, skirts, pants, dresses, jackets (see my post on the styles included). This book sparked off so many thoughts, my comments expanded to several posts. I’ve already posted about help for complete beginners and advanced beginners. This is a review of the ‘Dressmaking’ book. I’m writing another post on other routes to intermediate skills. I have mixed feelings about this book. I like project based learning. It’s good for people who like very classic styles and want to learn intermediate sewing techniques, plus starter skills for pattern altering to make new styles. Very good on technique. But difficult to read and look things up. In this book the typeface is small and low contrast so it’s difficult to see. The pages look lovely, but you have to peer closely to read the text. As this is an instruction book not a coffee-table book, I don’t think this is good book design. There are pages and pages of tools which you apparently have to have before sewing a single stitch. I’ve been sewing for 70 years and I still haven’t got all of them. This is a project based book. When techniques are described within projects, you need a good index if you want to look up a technique away from a particular project. Sadly this index is in such dim type you need a strong light to read it. And it’s not good. For example there are a couple of pages on openings (plackets), but they’re not mentioned in the index. Hmm – 5 out of the first 6 things I looked up in the index aren’t there, though they are in the text. So once you’ve learned to sew from this book, it’s not so good as a reference afterwards. 3 techniques which I think a first-timer would like a bit more help with. And in 200 pages packed with sewing instructions, there were only 3 steps which I didn’t understand. Alison Smith’s other books describe techniques and have drawings rather than photos. This book is about projects. If you work through these projects, you’ll have a good grounding in sewing techniques up to intermediate level, though only for standard weave woven fabrics. But she doesn’t suggest a best sequence for learning. You could choose any project, with minimum guidance on how difficult it is. If you do want to learn from a sequence of increasing difficulty, it’s probably best to work through all the projects in this book in the order given – from a skirt with darts, zip, waistband, to a lined jacket with lined patch pockets and shawl collar. Not as far as a structured notch-collar blazer. The technical descriptions for later garments are briefer and refer you back to earlier in the book. 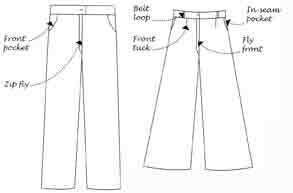 If you work through the whole sequence, you’ll learn competent sewing of standard woven fabrics and simple pattern altering. There’s usually only a few clearly explained new skills in each project. It would be a good learning experience to work through all the projects in this book – except that making 31 ultra-classic garments is a major commitment ! I wrote a list of the pattern altering and sewing skills covered in each project in the Dressmaking book, for my own reference. It might also act as a guide to a sequence of learning intermediate skills. When I first got the ‘Dressmaking’ book I wavered wildly for and against. It is difficult to read and find things in. The patterns are ultra classic. I’ve settled on being very impressed with the instructions for technique. Very easy to learn from at intermediate level. With over 300 large pages, this book is packed with information. But it can’t be all things for all people. The techniques are unusually easy to understand, but you may want to know about other fabrics or styles, easier or more advanced techniques, more guidance about fit. The techniques included can be used for making a wide variety of styles, not just classics. But the patterns are more limited. I love project-based learning rather than just working through a list of techniques, but I agree it is difficult to produce projects that everyone wants to make ! This also works well for me as an instruction book as I’m happy to sew at intermediate level. I have little wish to learn more advanced sewing techniques. But for some people that’s their big love. My interests are more in the direction of learning to make my own styles. What are the people who go to the supermarket in pyjamas aiming for ? – extremes of lazy comfort. Is it possible to have that lazy comfort and still look stylish ? I don’t think it’s the style elements that make you look slobby-sloppy-shoddy in pjs. I think it’s the state of the fabrics – unwashed, overwashed, stained, pilled, fraying. Basically pjs are classic casual styles. High quality of fabric and finish are essential if you want to look classy in casuals – quality always counteracts a casual effect ! My current favourite style words are “Relaxed Luxe”. Happily the days when stylists thought casual style meant you didn’t care about quality are long gone. Love tailoring ? elegant chic ? always wear pretty dresses? Of course there are many people whose personal style means they never get near the point where casual becomes slovenly, but what about the rest of us ? I’m inconsistent on this. I automatically hang up blue jeans. But I do like to be very comfortable and can easily slump into definitely-not-chic. So what are these comfortable comforting but stylish clothes ? This all got a bit long, so I’ve made the section on pj patterns into a separate post. 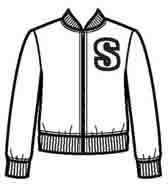 Lots of ‘bomber/ baseball/ varsity’ jackets in the high street here (summer 2013). Such as Simplicity 1940. 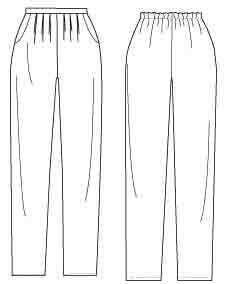 And ‘slouchy’ pants are loose at the hip but tapered at the ankle. Such as McCall’s 6514 view A. Many patterns for ‘slouchy’ tops. Oversized tops in soft drapey fabrics, so they show the body shape rather than standing away from it. 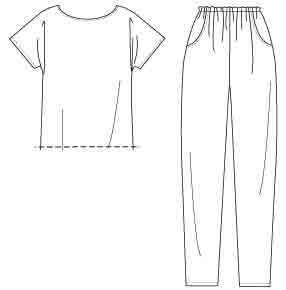 My favourite easy slouchy pattern is Butterick 5651, now oop – shows the idea has been around for a while ! Before Christmas I bought a ‘cardigown’ – a hip length dressing gown (US robe) made in light cuddly fleece. Apart from a down vest, this has been my most worn garment this winter. A double breasted wrap hoodie. So what would be a good pattern for copying it ? 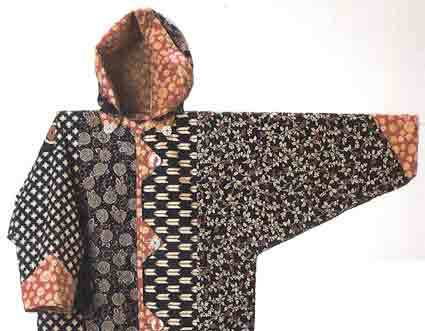 or Design and Planning Concepts Hooded Orknot coat. Make thigh length in snuggly fleece for a cosy indoor version. And for deep winter I have a Lands End robe (dressing gown) made with down. I’m planning to shorten it for next winter as I think jacket length will be more useful. I confess these robe/ gown ‘jackets’ are so cosy and comfy it’s had a disastrous effect on my willingness to ‘get dressed properly’. Hence I’m planning a post on pjs and similar patterns. See also my posts on designer Sweatshirts and Fleeces and hoodies. There are solutions to this problem of looking good while being very lazy. This isn’t just an over-reaction to the ultra-classic styles in my last post ! I’ve had many thoughts about this book, ‘Dressmaking’ by Alison Smith. A wardrobe pattern book with a focus on clearly explained technique. This post reviews the classic style patterns in this book, with suggested alternatives. With comments on building a classic wardrobe. Each wardrobe pattern book has it’s own style (see my posts.) Most are on casual or pretty styles. This is the first book on classic style, so it won’t be for everyone but fills an important gap. The ‘Dressmaking’ patterns are pure classics based on fitted blocks with fitted armholes, most with zip opening. Plus instructions for simple pattern changes to make 19 variations. A good range within one personal style and ease level. As my body shape is far from average, I’m not the right person to test these patterns to find how well they work. These patterns are such simple basic styles it’s easier to adapt my personal fitting blocks, rather than going through the fitting process with these patterns. These patterns won’t warm your heart if you like casual slouchy/ body-con, frilly/ drapey/ vintage, or trendy styles. No dartless styles with dropped shoulders. No raglan or cut-on sleeves. No slimmer pants, or tops with generous or negative ease. No notched or band collars (though sufficient instructions are there). No dresses in dartless shift, wrap, or draped styles, and those can be more flattering for many body shapes. Nothing on sewing knits, fleece, denim. 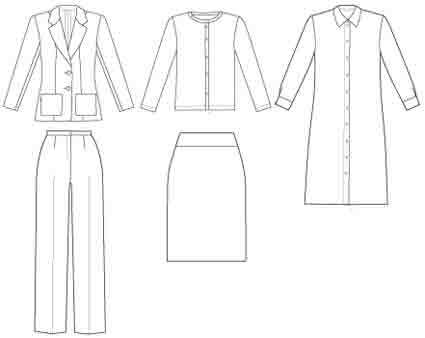 The late Shannon Gifford thought you need 5 basic pattern blocks : pants, a-line skirt, classic shirt, fitted tee, jacket. All but the tee are here. I like to have basic blocks for drop-shoulder, raglan, and cut-on sleeves as well as fitted armholes. And I use a casual dartless block a lot. Some people like a separate block for slim fit pants like jeans. None of those are here. If you follow designer fashion these patterns will look a bit dull. Nothing here if you want to mimic this season’s high fashion (see my review of seasonal trends). Or a tees-sweats-jeans or tunic-leggings look. Or a cascade cardigan or notch collar blazer. The patterns are best suited to ultra classic personal style in woven fabrics. For ‘modern classics’ including knits, see styleARC patterns. Using these patterns, you couldn’t copy the basic wardrobes from Janice of The Vivienne Files. Here’s her casual wardrobe , and here on a wardrobe as a background to accessories. My posts on patterns for these are on a wardrobe of relaxed basics and a common wardrobe. If you like casual styles, you could combine the sewing instructions in this ‘Dressmaking’ book with Wendy Mullin’s pattern books. Her patterns have a wider range of style elements and basic blocks but sometimes poor sewing instructions (and beware the fit. 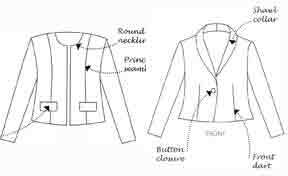 See my wardrobe pattern book reviews – Index page 3). What about flouncy or vintage styles for skirt and dress lovers ? Those can easily use the Steampunk clothing company production. The Colette Patterns or Burda Style pattern books might be a better choice, too. I haven’t seen the Colette Patterns book. I have seen the first Burda Style book, which isn’t right for me as it has brief written instructions with few illustrations. Also Gertie’s new book for better sewing, which I haven’t seen as it isn’t my style or body shape. Here’s a helpful review. For draped styles there are the ‘Drape, Drape‘ Japanese pattern books. I haven’t seen these books, but Japanese pattern books are usually very visual – many diagrams and few words. See Simply Pretty for extended images from Japanese pattern books, to see the instruction style (or get the Japanese editions of the ‘Drape, drape’ books :D). Co-ordinate fabrics and colours to make a wardrobe. 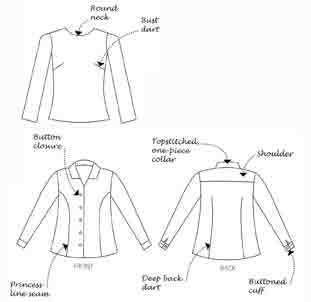 Using the patterns in ‘Dressmaking’ you can make clothes similar in style spirit to Nancy Nix-Rice’s basic starter wardrobe. Here’s the first of my posts on it. Better to read her complete set of newsletters. Nancy suggests you use 3 colours : dark neutral, light neutral, accent colour. – top and skirt in mixed colour print. You couldn’t copy Nancy’s suggested styles exactly using the ‘Dressmaking’ book, as there isn’t a pattern for notched collar or knits. And Nancy doesn’t include any one-piece dresses. Perhaps use Butterick 5760 wardrobe pattern for the further classic styles needed, once you’re familiar with the techniques in the ‘Dressmaking’ book. Add making a band collar, a more structured jacket, and a knit cardigan to your skill set. Or just make the 12 dresses in the ‘Dressmaking’ book – plenty enough for a classic ‘dresses only’ wardrobe ! Once you’re happy with a bit of pattern altering, you’ll be able to combine patterns to add collars and different sleeves to these dresses. Though with only a narrow range of shapes. My first posts inspired by this book were on sewing guidance for complete beginners and advanced beginners. The technique instructions in this book – for intermediate level skills – are very good (I plan to write on this later). And they apply to any style. But the patterns won’t be to everyone’s taste. I don’t wear such extreme classics, so need to adapt the patterns a bit. Lengthen the skirts and jackets, make sleeveless vests from the jacket patterns, taper the pants, make tunic versions of some dresses. . . (examples of all these pattern changes are in the book). Shortened versions of the waist seam dresses can be used for tops while peplums are so popular. With my personal style, body shape, and local climate, I’m unlikely to make any bare-shouldered styles, unless I just made them to try the skills involved. I’ll go elsewhere for my favourite loose fitting layering top and jacket patterns. The same pattern altering and sewing techniques apply to the casual dartless block, but there’s no pattern here to use as a starting point. Other guides also needed for sewing a wider range of fabrics. Even if ‘classic’ isn’t your style, they can be good to use as background basics. Here’s YouLookFab on using a few classic items with others. The cover of this book claims it’s a ‘one step resource’. It isn’t that, but it is very good on the styles and techniques it does include.